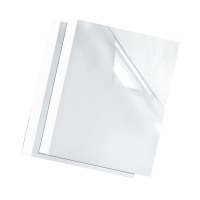 Supplied in a pack of 100, Fellowes Thermal Binding Covers are suitable for use with all thermal binding machines to give a professional finish to documents. Supplied with a clear front and thick satin-like white card back, these covers are ideal for projects, presentations or sales pitches when first impressions count and quality is key. Pre-glued & pre-scored for your convenience, these covers fit quickly and easy to your work with the minimum of fuss. With a 3mm capacity, they're suitable for between 10 to 30 sheets.